On May 18th, 2013, the largest animal rights demonstration in canada since '84 took place outside of the newly constructed anti-protestor fence at the front gates of marineland. Over 1000 people from all over north america converged on opening day to spread the word that torture is not entertainment, that captivity is not cool, and to demand that canada’s largest water animal jail - marineland be shut down! During the day i spoke with several action participants and organisers and the following is what some of them had to say. 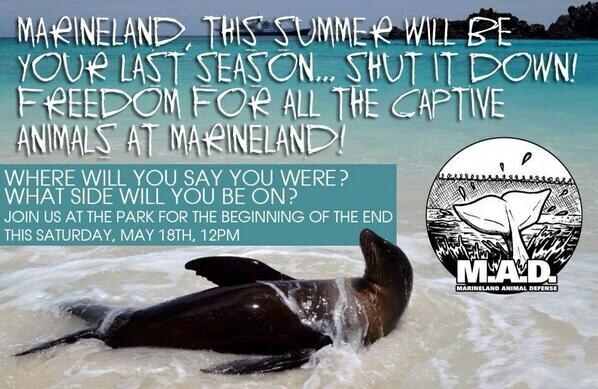 You will hear from marineland animal defense (M.A.D.) organiser, Dylan Powell, along with Wendy Bones of Kitchener ontario animal liberation association (KOALA), and the legendary Ric OBerry of the Dolphin Project. You will also be treated to a fresh track (and an old one) from revolutionary hip-hop artist Testament and may be overwhelmed at times by the roar of the engines from the attending Sea Sheppard motorcycle crew.